I've only been using Strike a short time. 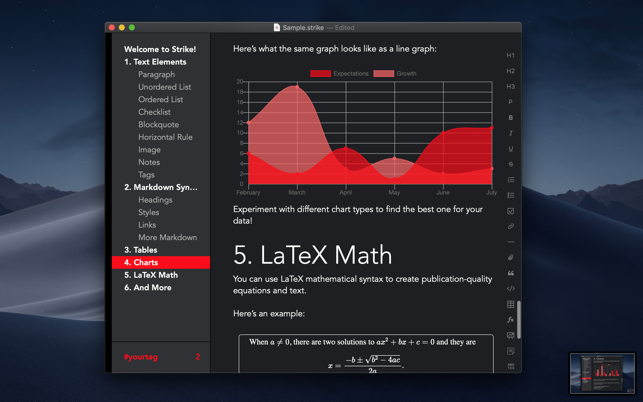 I bought it for Mac and iOS. iCloud sync is great. I've already moved several Markdown articles into the app. There's a handy shortcuts bar at the right of the page. 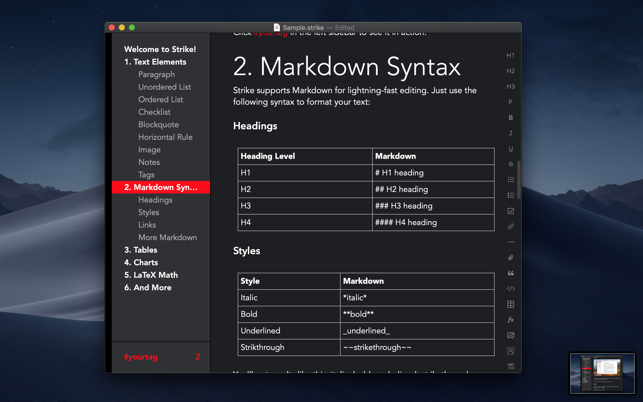 You can easily tag a #, ##, i, B, or other, if you don't want to type the Markdown syntax. Also, you can, in the preferences, hide any shortcuts from the bar that you don't use. The killer feature is drag-and-drop within documents. Ulysses also has this, depending on how you structure your documents. 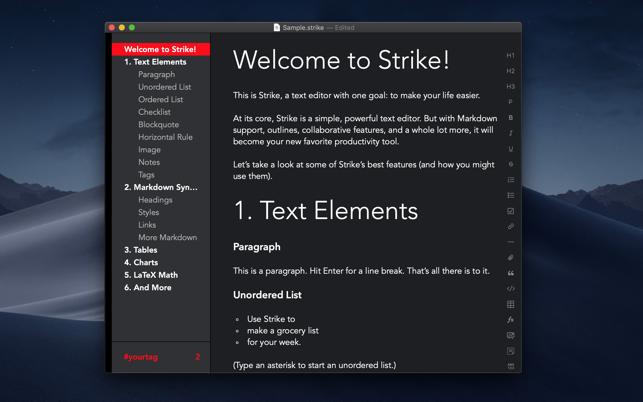 In Strike, it's more easily discoverable. As you write headings, they appear in the left nav. 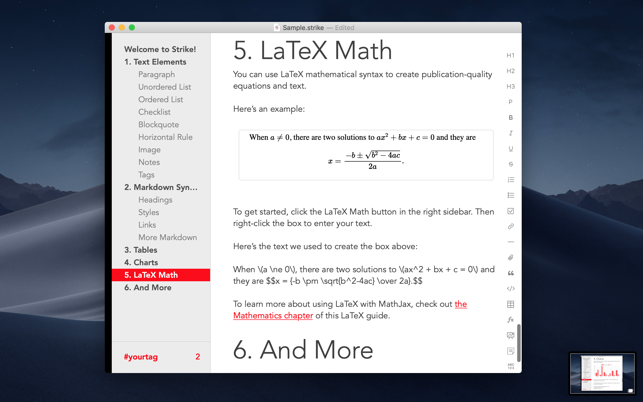 In the left document nav, you're headings are listed. You can reorder headings, with all the underlying content, by dragging a heading to a different spot in the document. This is incredibely useful. You can export your writing to a number of different formats. You can do a CMD A, and then copy everything as Markdown. Id' love to see a document browser as another lef-pane in the app, but that's small stuff. 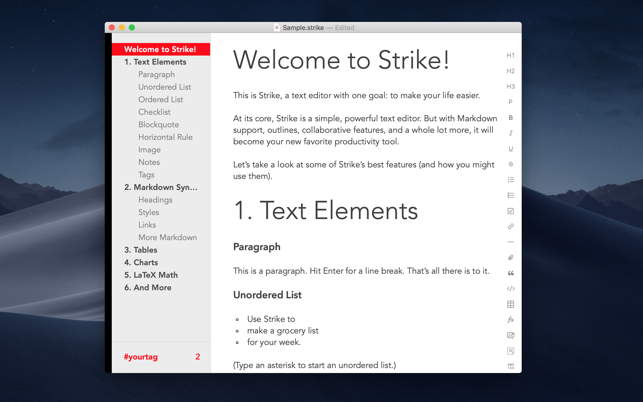 For a version 1.0, Strike delivers on capability in performance in a serious way. Awesome value. This is made by the same team that makes Airmail. They've got a solid track record. This is it! The editor I’ve been waiting for. As a programmer I often use the Markdown text format to write documentation. 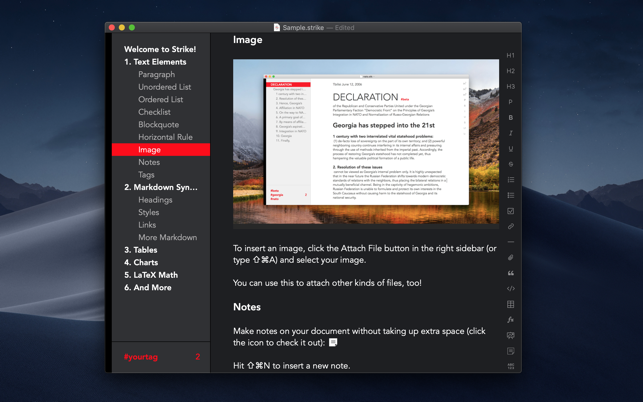 While Markdown is easy to use, there aren’t a lot of great tools for editing, and its capabilities are quite limited. 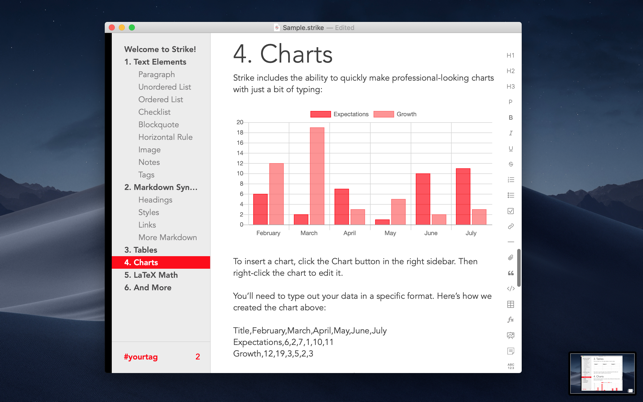 Now, with Strike, I have a beautiful and full-featured editor that allows me to use Markdown but adds super-useful features like charts and checklists. Despite being full-featured it is incredibly fast and feels lightweight. Cannot print tables or charts. Just leaves large blank areas. May be other bugs, but this is serious enough to call into question the quality of the entire app. In reading the reddit discussion, there looks to be some serious concerns about the developers' intentions or abilities to maintain the app and respond to bug reports — which is critical with any app's initial launch. My strong recommendation is to wait and see if the issues are addressed. I will be asking for a refund.